Some 350,000 homes in Gloucestershire will soon be without water because of flooding at a treatment works and 600,000 could lose power supplies. The county's Chief Constable Tim Brain said the force's main priority was to keep Walham Switching Station dry. Thousands of homes are already without tap water and supplies in Gloucester, Cheltenham and Tewkesbury are due to run dry in hours. In addition 15,000 homes have no power after a sub-station was switched off. "The barriers may hold but they may be over topped because we're expecting another high watermark this evening at about midnight and again tomorrow," said Dr Brain. "With respect to the Mythe water treatment works that is still out of action and there I am afraid to say the prognosis is not good. "The best case scenario is seven days and we have been told up to fourteen days before it can become fully operative." Bottled water and 600 water tanks have been brought in to bolster drinking water supplies. Fraser Pithie from Severn Trent Water said: "Most of Gloucester city has no water now; Cheltenham still has got water but obviously its likely to lose its supply later today." Mr Brain added: "I must emphasise that the situation we face remains unprecedented. "There are still high levels of water and there is still more water to come down the Severn and other tributary rivers and we have by no means passed the peak of the ongoing emergency. We are not yet in a full recovery stage." Gordon Brown visited Gloucestershire earlier to tour the areas worst hit by the flooding. The prime minister said the response of the emergency services had been superb. "We will provide crisis and care grants for people to make sure those who are displaced are given help and we will make funds available to local authorities in this area to make sure they can do what's necessary," he said. An overnight operation was carried out at the Walham Switching Station, which supplies half a million homes in Gloucestershire and south Wales. In a statement the Environment Agency said staff worked with the military, fire and rescue services and the police to put up flood barriers around the site. But with another high tide expected on Tuesday night the flooding is far from over. The chairman of the Environment Agency, Sir John Harman, said the huge amounts of rainwater that had entered the river system were now heading downstream towards major centres. 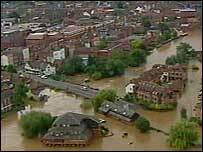 He said the Severn would continue rising in Gloucester until Tuesday afternoon. A number of public health issues have been identified as a result of the flooding. BBC Radio Gloucestershire is running special programming with regular updates on the flooding. 80% of homes whose supply was cut off in the floods could have water by Wednesday. Readers' pictures of flooding in Gloucestershire.